3D may not be anywhere close to widespread acceptance in consumers’ homes, but it’s doing just fine in theaters, thank you very much. According to one trade group study, 3D movies have captured one out of every three dollars spent at the domestic box office in 2010 so far. The International 3D Society (I3DS) has released its finding that just four 3D films have earned $1.2 billion in ticket sales out of a total of nearly $3.6 billion in total sales thus far in 2010. The four films are Clash of the Titans, How to Train Your Dragon, Alice in Wonderland and Avatar. 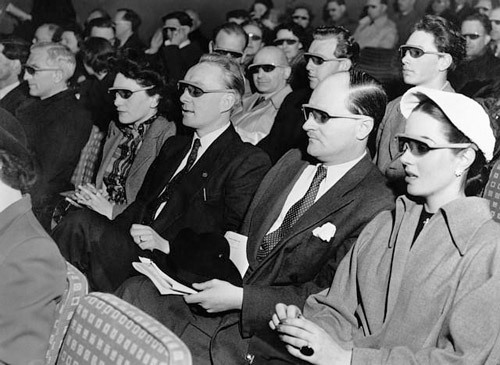 Insiders, how many of your movie dollars have gone towards 3D films lately? Is this just another high point in the 3D cycle that seems to come and go every few years, or is the format finally here to stay? Leave your thoughts in the comments. It seems to me that I3DS is applying all of the revenues from the movies that are available in 3D versions into the 3D movie revenues category. I wonder how the totals would look if they split the revenues out for the 2D versus 3D versions of each of the movies that were available in both formats? I think most 3D films are targeted to family and kids which draws more of an audience if avg household size is 3.20 and with at least 10 more family movies coming out this year is can see 3D ticket sales going up especially this summer with a few animated films like Toy Story 3 and Shrek 4 and Despicable Me. To add, Clash of the Titans- post production 3D was just awful! Given a choice between 3D and 2D I would choose 2D every time. I can’t stand the look of the new (or old) 3D. If I were the movie studios I would be cautious about drawing too much inference from this data. Given that the #1 movie (in non-inflation-adjusted dollars) of all time was last year, it could easily be just a temporary spike. Of course I am not the movie studios. Nor am I the TV manufacturers. Both of whom seem to be jumping on this “3D” thing like the last grain of rice on Survivor island. 3D is a big deal right now for sure. I personally have seen a lot of movies in 3D lately. I saw Avatar, How to Train Your Dragon, Alice In Wonderland in 3D. It is cool stuff. It is better than it used to be with the new polarization tech in the glasses you wear. The old red & blue was just a headache for me, and if you took your glasses off you couldn’t see what was going on. Now it is much better because you can’t see a difference between the two frames of the glasses and if you take them off you can see what is going on – hooray! It is good to see they are focusing on a sense of depth and realism as opposed to just a bunch of 3D tricks. I don’t (yet) understand why you need a different kind of TV to see a 3D picture? I mean at the theater I used to work at, when we got a 3D film, it would just go on the regular projector and screen. It is the glasses that do the work, right? Weird, is it a marketing ploy maybe? Avatar was easily the most creative movie ever. Like Shrek movies, awesome animation.